Today, we’re excited to launch the second DataShift research report from our three pilot locations – Nepal, Argentina and East Africa (Kenya and Tanzania). We want to know more about how data generated by citizens is being used in Nepal: what difference is it making? 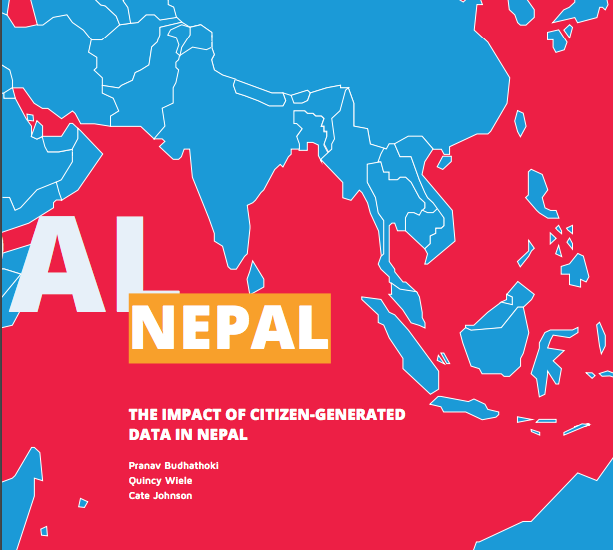 Citizen-generated data initiatives in Nepal have helped many civil society organisations and institutions share information about citizens’ needs and decide how to respond to them. More than 100 community radio stations regularly use Open Mic bulletins to develop radio content debunking rumours about earthquake relief for an estimated 1m listeners per week, while Nepal Monitor’s data on human rights-related incidents is shared with more than 850 embassies, international NGOs and other international bodies. But the government only rarely uses and accepts citizen-generated data. Although Nepal’s cabinet following the April 2015 earthquake used Quake Helpdesk’s data to identify community needs after the earthquake, the call-centre that was set up by the government shut down two months later. Only Hamro Police App collects data that is being used in ongoing monitoring. This lack of use is partly because of government’s limited technical expertise, and partly because civil society organisations have failed to convince government agencies that citizen-generated data could be useful to them. Although many initiatives’ goals were aligned with the Sustainable Development Goals (SDGs), few initiatives paid significant attention to them. Aligning their work specifically with the SDGs could help amplify their impact and allow them to reach a wider audience. Citizen-generated data initiatives often physically collect data using their own staff, because low literacy levels and limited connectivity mean that technology-based data collection methods are out of reach. This can make initiatives labour-intensive, and contribute to errors when the monitors submit data that’s incorrect. Verifying citizen-generated data is difficult and time-consuming in Nepal: only one of the four initiatives had an established process for verifying information. What verification did take place usually involved a staff member calling each individual citizen that had made the report, to confirm it over the phone. This process required substantial amounts of staff time, and inevitably involved errors (such as when the phone number written down was incorrect). To build on existing progress, government, technology and civil society actors need to agree on the value that citizen-generated data can add and start to use that data to influence policy-making, as well as building up technical capacity in civil society organisations.